It’s hard to get excited for “the finance talk” with your partner, but it’s a necessity. To make the most of the conversation, it needs to be more than just asking your significant other how much money they spend on take-out every month—these talks have to be comprehensive, since any bit of miscommunication can have a big impact on your finances (and potentially your long-term relationship). Here are seven financial questions you should be asking your partner. 1. HAVE THEY EVER MADE A MONTHLY BUDGET? In a perfect world, both of you would know exactly how much you need every month for your vital expenses like rent, insurance, food, and utilities. Ask your partner if they’ve ever given any thought to a monthly budget, or if they just wing it from check to check. Whatever the answer is, you’ll likely get some insight into just how financially responsible they are. 2. HOW MUCH MONEY DO THEY MAKE A YEAR? Start your conversation with the basics: How much does your partner make a year? You can’t figure out a budget or talk about debt repayment plans without knowing how much money they’re bringing in every month. From there, you can open up the conversation to all of the other points you need to address. 3. HOW MUCH IS LEFT AFTER MONTHLY EXPENSES? As you know, the number on your paycheck is only half the story. You also need to know a little bit about your partner’s expenses—how much money do they bring home every month after taxes, rent, insurance, utilities, and the like? By talking about these monthly expenses, you can get a clearer picture of what they spend their money on and notice any spending habits that might need to be addressed. 4. WHAT IS THEIR CREDIT SCORE? Your partner’s credit score isn’t just important for them to know, it’s also necessary for you if you ever co-sign a mortgage or any other type of loan with them. If they don’t know their credit score off the top of their head, don’t worry: Many people don’t monitor their score as closely as they should. What’s important is that you and your partner both check out your credit scores as soon as possible, especially if you’re looking to make any life changes together. Remember, knowing where you both stand is half the battle, and Discover’s free Credit Scorecard* is a good way to ensure that you and your partner have a handle on your credit scores. Seeing and reviewing your scores are the very first steps. 5. WHAT IS THEIR MONTHLY DEBT PAYMENT? People can naturally be self-conscious about their debt, but this discussion is not about making judgments. This information is necessary as you plan out your monthly budget with your partner. It helps establish how much they are realistically able to contribute if you live together, and it will inevitably have an impact on your own finances as well. Having a total debt amount to work with can be a key way to understand if you’ll be likely to attain a proper loan or make any big purchases, like a car or home. So once you get the full picture, you can form a proper budget and have an idea of how much money you and your partner actually have to utilize. 6. DO THEY HAVE ANY MONEY SAVED? Having a rainy-day fund for any unexpected expenses that may change your financial outlook, like a loss of job, medical bills, or car repairs, can help. During your financial talk, ask your partner if they’re prepared for those kinds of surprises. Knowing that your partner has some money stored away will be peace of mind for you as well. 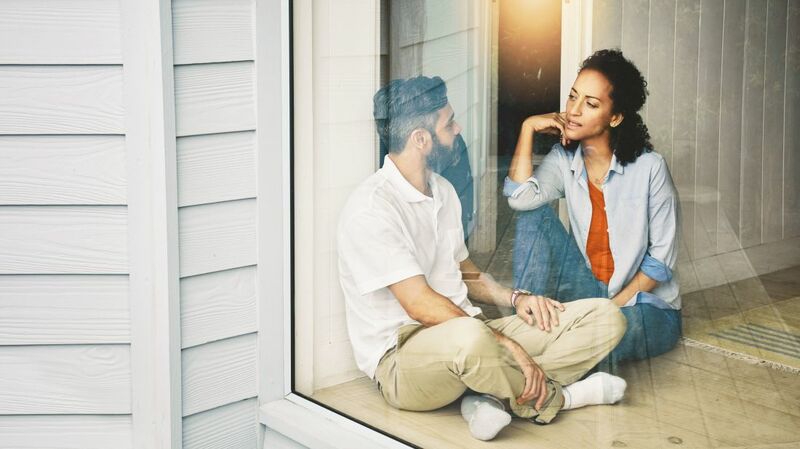 If you’re planning on moving in together, there possibly will be unexpected expenses that crop up along the way, and savings can help ease that transition. 7. HAVE THEY STARTED SAVING FOR RETIREMENT? Though the answer isn’t a make-or-break deal depending on your age, knowing what your partner’s retirement plans are will clue you in on just how far into the future they’re looking. It lets you know that they take their finances seriously and understand the importance of being prepared for what’s to come. And knowing how they’re planning could give you a better picture of what you need to do to ensure you’re on firm financial footing together as the years go on. Having the finance talk will be easier if you gather all of your key details beforehand, and that includes knowing your credit score. Discover offers a Free Credit Scorecard -- it's totally free, even if you aren't a Discover customer, and checking it won't impact your credit score. Check yours in seconds. Terms apply. Visit Discover to learn more.